To work with international students in the U.S., either through teaching English or international student advising. As a student in Teaching English to Speakers of Other Languages (TESOL), my teaching internship in Beijing game me real-life experience in my field. This was the perfect capstone to my studies at IUPUI. 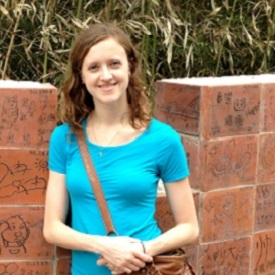 The TESOL semester internship in Beijing provided me the opportunity to apply the second language acquisition theory that I had learned in my courses at IUPUI while learning more about China than I ever could have at home. Can you ever fully know what to expect from a study abroad experience? Surprises are part of the fun! I can say that everyone I worked with, both on the IUPUI and the Beijing sides, were always helpful and supportive. I couldn't have asked for better people to work with. I already have! I am lucky in that I studied abroad as an undergraduate, then in graduate school at IUPUI, and after graduation I abroad again as a Fulbright English Teaching Assistant in Brazil. Patience, perspective, gratitude and friends.